Finite details in designing of an efficient pretreatment washer need to encompass a multitude of variables. The current marketplace dictates that any prospective system integrator has a thorough knowledge of the chemistry being employed, the waste handling of the various solutions, as well as the primary equipment being supplied. Too often end users have purchased inferior systems that didn't account for a critical detail. 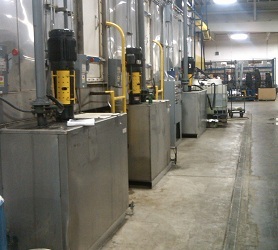 Ace’s paintline systems are commissioned to efficiently process Class A finishes, while minimizing environmental impact. Our systems are designed to improve paint adhesion and provided corrosion resistance, while minimizing waste produced. Coordination with your chemical and paint vendors is standard procedure, ensuring all parties involved are well informed throughout the procurement, installation, and start-up procedures. Multi-stage spray and dips lines for processing of zinc/iron/manganese phosphates, aluminum conversion coatings, and plastic washing are available. Heating methods include plate and frame exchangers (water or steam), double plate and frame exchangers to minimize solution scaling on phosphate solutions, electric elements, gas fired immersion tubes and steam plates/coils. 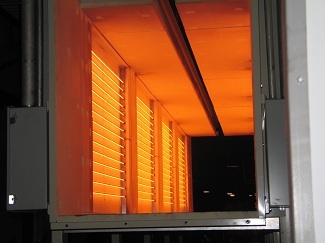 Regardless of part shape, thickness, or rack design, a uniform heat and cure is necessary for quality purposes. Equally important is even cooling of the part prior to packaging. Whether you require a paint bake oven, parts dry-off, batch oven, air blow-off, or a dehydration unit, Ace Manufacturing can design and commission a product suited to your specific requirements. 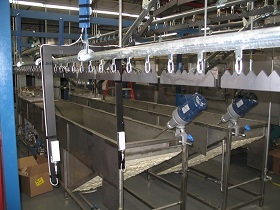 Preassembly of standard modules minimizes installation time while ensuring quality fabrication. Reinforced floor panels, insulated walls, adjustable air flow, PLC controls, and stylish design are common on Ace’s systems. Booth designs are meticulously scrutinized to ensure removal of airborne particulate while providing the highest degree of paint transfer efficiencies. Paint booth applications include waterborne, solvent based 1K and 2K, and powder. Ace's team of industry professionals promote the highest finish quality when designing booth enclosures, air make-up units, recirculation systems, filtration requirements, and when addressing environmental issues. Down, cross, side and water wash booths are available. Ace’s personnel respect the capital investment that you are making, thus we incorporate our knowledge with that of the leading manufacturers of paint equipment to ensure each installation is seamlessly commissioned. The legal requirements of air purification and emissions can be trusted with us. Environmental engineers review each installation, ensuring Pre-Start Health and Safety Reviews are completed as part of your due diligence. Material handling is carefully selected to best suit your product and facility, and includes overhead monorail (power pull or power and free), enclosed tracking, programmable or manual hoists, robotic transfer stations, and belt conveyors.